This four-bedroom beachfront resort villa is absolutely gorgeous. 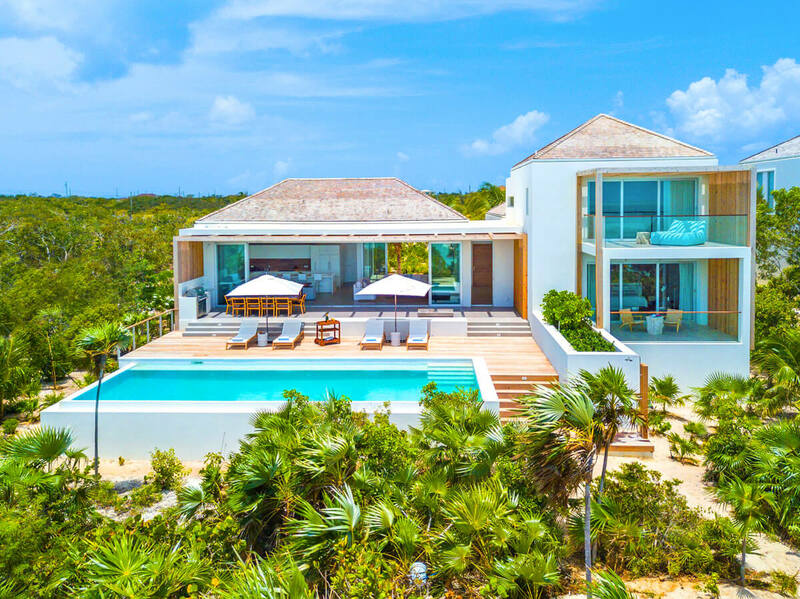 It’s on Long Bay, which is the quieter, windier sister to Grace Bay, and it’s in a gated community with fitness facilities, a butler and housekeeper, and beach services. If you want a resort experience with plenty of space and privacy, this is perfect. Beachfront villa with Unobstructed Views! Beach Enclave Beach Front Villa’s four-bedroom design is breathtaking. Sitting steps away from Long Bay, this resort villa is enveloped in tropical gardens and sunshine. Unobstructed ocean views surround the 38 x 14 foot infinity pool. A wooden sun deck with loungers, umbrellas, and a barbecue grill borders two sides of the pool. There’s al fresco dining on the pool deck and amidst palm trees in the garden courtyard. Down on the beach, there’s a lounge and shower. Kiteboarding and stand-up paddle boarding are popular along Long Bay, but its white sand is just as perfect for sunbathing. Beach Enclave has a water sports facility in partnership with KiteProvo that offers non-motorized equipment like kayaks, paddle boards, snorkeling gear, and paddle snorkeling. KiteProvo also offers Beach Enclave guests complimentary eco paddling tours through Turks and Caicos’ mangroves. At Beach Enclave’s Retreat, enjoy daily yoga sessions and a 24/7 fitness center. Eight consecutive sliding glass doors open to the living and dining area, which is generously sized and elegantly furnished. High vaulted ceilings, neutral tones, and cool tile floors run throughout. The living room has plush couches and a flatscreen TV, while the adjacent dining table seats 10. Pristine white cabinetry and an oversized island furnish the kitchen, which is equipped with stainless steel appliances. A breakfast bar, blender, espresso machine, coffeemaker, and gas stove round out the kitchen’s amenities. This level also has a media room and office, which feature the latest technology and sleek lines. The media room also has a sofa bed, so it can be an additional bedroom. Beach Enclave’s four bedrooms each have neutral color schemes and natural accents, like rugged, wood headboards, shearling rugs, and woven floor cushions. Two of the main level suites open to the garden patio, and the third has its own patio. The two garden patio suites feature a king bed and two twin beds, and both have a walk-in shower in their ensuite bathrooms. The third main level suite has a soaking tub and outdoor shower in its ensuite bathroom. The upper level is dedicated entirely to the master suite, which has a lounging balcony with glass barriers and ocean views. Its ensuite bathroom features a soaking tub, an outdoor shower, and a walk-in shower.